Standard: (In. 2 & 3 open) standard operation at maximum speed without reversing fan. Reduced speed, continuous: (In. 2 close, In. 3 open) with trimmer 1 the operator can set fan speed to reduce it. Reversing fan not enabled. Standard, reversing fan: (In. 2 open, In. 3 close) standard operation at maximum speed with reversing fan. 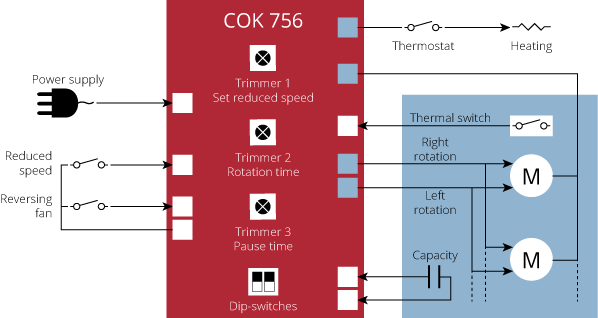 The operator can change rotation and pause times using trimmer 2 and 3. Reduced speed, reversing fan: (In. 2 & 3 close) fan motors are controlled with reduced speed and rever sing fan. Using all 3 trimmers the operator can set rotation speed, rotation and pause times.